For years, electric handpieces have taken the gold in terms of efficiency and patient approval, but air-powered options may have just caught up. 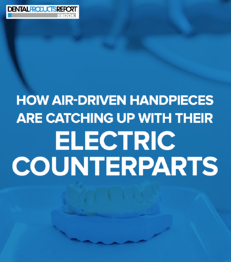 What air-driven handpieces offered in weight and ease of maintenance couldn’t trump the overall efficiency of their electric counterparts, but with advancements being made to both handpiece options, the argument may just be rather futile. For dentists who would like to implemented newer technology but are held back by cost, a new handpiece is a good place to start. In this e-book, we’ll show you why just deciding between electric or air-driven is no longer an option.